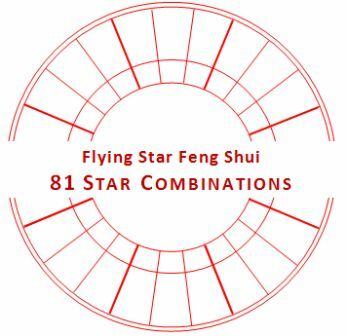 Much ado about 81 Star Combinations in Xuan Kong Flying Star Feng Shui, where it would seem that many practitioners like to get a hold of the table with 81 Star Combinations, such at the speed of light actually. Anyway, you’ll have seen how those tables with 81 Star Combinations used for purpose of house divination in Flying Star Feng Shui would be saturated with virtually only mishap, disease and disaster. This cannot be the purpose of Classical Chinese Feng Shui. 9 Stars will be alternately ‘timely’ or ‘untimely’. And nothing we can do about it, while, rather, 9 Stars remain functional, whether deemed ‘Inside Yun’ or ‘Outside Yun’. A Star in your Flying Star chart is not auspicious, just because it is ‘timely’. A Star is not inauspicious, just because it is ‘untimely’. We say “Forms govern Stars”, so that, a so-called ‘timely and auspicious’ Star can still cast ill influence if not adjusted well. A Star, otherwise perhaps deemed ‘untimely and inauspicious’, can be brought to favorable behavior, once it finds good Form and Use (Yong). That’s the whole idea in Flying Star Feng Shui. According to San Yuan Jiu Yun 三元九運 (and that alone), 9 Stars can be alternately Inside Yun (Dé Yùn 得運) or Outside Yun (Shī Yùn 失運). Currently in Feng Shui Period 8 (2004-2024), Star 8 ‘has’ Yun and it is the Ruler. Fei Xing is not San Yuan. In fact, just basic Fei Xing prescriptions have it that, whether any of 9 Stars Inside Yun or Outside Yun (miss Yun), 9 Stars may be employed unabatedly. We know that, before at all ‘mishap’, or ‘disease’ or ‘disaster’ to occur, we would have already duly minded just those time tested Fei Xing prescriptions in our toolbox (the least of which are Host-Guest, the Mountain and Water Principle), so that a table with 81 Star Connotations should never even apply. We find ‘a’ Star ‘Inside Yun’, just Fei Xing prescription will deal with that. We find ‘a’ Star ‘Outside Yun’, just the same, just Fei Xing would know how to deal with that. ‘9 Stars will be alternately timely and untimely‘ is what we get if Chinese characters are translated wrongly, then become gospel. The ancient masters, however, where no fools and would have never said so. But, fine, at least that’s still supposition. ‘Timely and auspicious’ or ‘Untimely and inauspicious’ comes from an even more enstranging contraction and is squarely against everything that Fei Xing is good for. If you are a serious practitioner, the more if you are a teacher or a professional consultant, you would best replace ‘timely’ by ‘opportune’, then ‘untimely’ by ‘less opportune’, that’s all. But it is critical that you did so. Each time that you note a Mountain Dragon or a Water Dragon in a Flying Star chart, you just think Host-Guest, then Mountain and Water Principle, where Mountain may be an elevation, but can be taken as the Principle of ‘close and disallow pathway for Qi’, while Water may be H2O, but can be understood as ‘open and allow pathway for Qi’. So busy you would be with this alone, that there’ll be no time to see Mountain and Water Dragon, then think ‘mishap’, ‘disease’, ‘disaster’ or any such connotation. In Fei Xing we say ‘Forms govern Stars’. Fei Xing also has it that, we can bring out the beneficial behavior and temperament from out of just any Star, be it a so-called ‘timely’ or an ‘untimely’ Star, or as we may find one certain Star in combination with whatever certain other Star. It’s fundamental. It’s only a dead give away, therefore, that as such, Star ‘combos’ could not have a final say in what’s auspicious and what’s not. Final say in Fei Xing is in Forms, it is in Host-Guest, it is in your employing the Mountain and Water Principle, while moreover and to begin with, health and prosperity do not lie in ‘Stars’ or ‘combos’ of Stars, but of course in life style, belief system, decisions made, diet and food intake, health and ‘cell memory’ (epigenetics). Just faithfully practicing fundamental Fei Xing principle and solid Fei Xing prescriptions, in mind then Host-Guest, the Mountain and Water Principle and your common sense, would never lead you to any table of 81 Star Combination, while, if you’re anything like me, you wouldn’t dare give out even a portion of such a table to even a lecture audience.